The goal when we purchased the Chalet was to make it livable, comfortable, homey, warm and the perfect place to entertain friends and family. The furnishings were sourced from a variety of stores around Switzerland and were picked to blend with the extensive wood features and white stucco finishing on the walls. The stone tiling on the ground floor hallway, bathrooms and kitchen is dark gray slate. The bedrooms, living room and dining room are all birch hardwood. Exterior finishing on the building is weathered pine. The Chalet is being rented fully furnished and outfitted for you to move in and entertain immediately. One of the outstanding features of the Chalet is the exceptional pine joinery that makes up the vaulted ceiling. 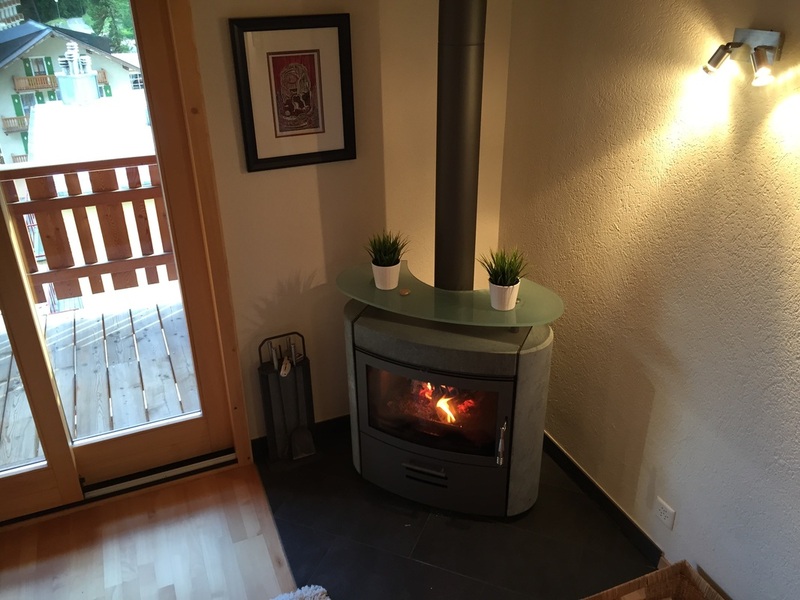 There is a high end wood burning stove in the corner that takes the chill out of even the coldest nights. Across the living room and dining room is the birch hardwood flooring. There are two recliner like rocking chairs (one with a footstool), a large sectional that turns into a fourth double bed with storage. There are extra blankets, games, side tables, a wood box, fireplace tools, and a large cozy rug to lay on in front of the fire. 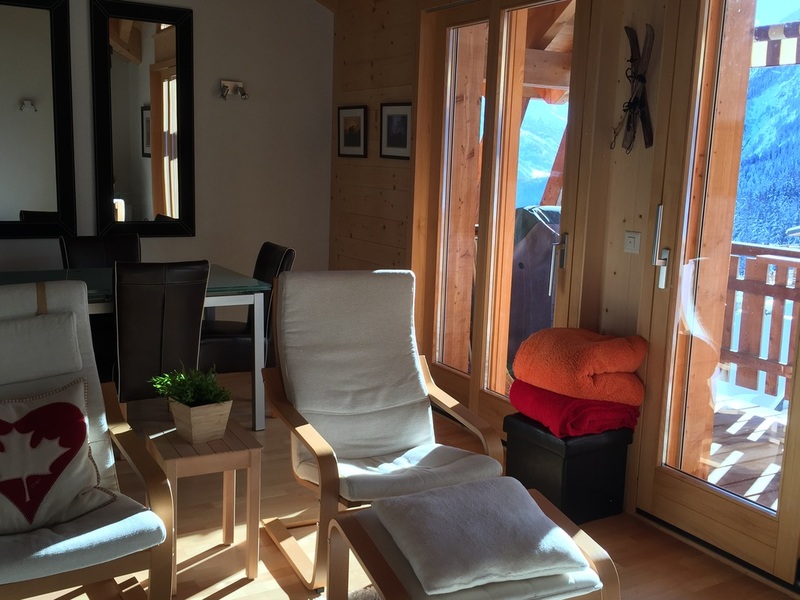 The Chalet is fully-furnished in quality furnishings through out. We tried to stay away from Ikea when it came to furniture and almost succeeded. A couple of the pieces of furniture wardrobes and shelves are courtesy of our famous Swedish friends. The bulk of furnishings are from Conforama and Top Tip. There are high quality Bosch electric appliances through-out the Chalet. The kitchen has a stainless steel Bosch fan-hood, stove and oven. The fridge and freezer is a adjustable temperature Bosch model. The full-size dishwasher in the kitchen is also a Bosch appliance. In the basement is a full size washer and dryer for laundry. Heat, Hot Water, Internet, Etc. There are heated floors in both of the bathrooms and on the main floor in the kitchen dining room and living room. Further, there are electric baseboard heaters in each of the bedrooms and in the main entranceway. Finally, there is a space heater in the basement for use during the winter to keep things from freezing if the Chalet is left for long periods of time. There is a large hot water heater that provides hot water for the flooring, showers and washing. There is sufficient capacity for six hot showers in a row. The Chalet has activated high speed wireless cable internet. It is fully wired for cable TV, and telephone, however we have not hooked these features up. There is a Swiss Mobile phone for emergency calls. The kitchen is fully equipped and is one of the centrepieces of the Chalet. It features high quality cabinetry with significant amounts of both counter and storage space. Four barstools allow guests to watch the chef prepare dinner or eat breakfast. There are eight sets of cutlery and dishes, pots, pans, spices, mixing bowls, cutting boards, water bottles, mugs, cups, glasses, wine glasses, champagne flutes, serving bowls, serving and mixing utensils, a mixer, a kettle, 10 cup drip coffee maker, a toaster, cookie sheets, and a Nespresso machine. There are kitchen towels, pot holders, and place mats as well. The stove is radiant heat with a fully flat glass surface and the oven has multiple settings. Finally, rounding out the kitchen is a six person authentic ceramic fondue set. Technically, this is an extension of the living room given the open plan nature of the main floor in the Chalet, but the dining area contains a large glass table capable of seating 8 people comfortably (there are two leaf extensions that change it from a four person table). In addition, there are six comfortable leather chairs to sit at. Further, there are two large mirrors which give the dining area a roomier feel and allow everybody to have a view. The bedrooms are cozy and typically Swiss. Each room has an adjustable double bed on floating lattice type frames with medium hardness Swiss designed foam mattresses. Full duvets and oversized pillows allow for a warm and comfortable nights sleep. There are storage drawers under each bed and extensive hooks in each room. In the back bedroom there is a medium sized storage unit for linens or clothing and in the master bedroom there is a full size wardrobe closet with mirror and hanging rack. The Chalet has two bathrooms. The guest bathroom has a tub with a shower fixture, a large spacious area including a sink and a toilet. The second bathroom is attached to the master bedroom and contains a stand up shower enclosure. Both bathrooms have heated floors, towel racks, extra hooks, storage drawers, mirrored and lit medicine cabinets. There are two wooden decks. There is a moderate sized deck off of the main floor. It has ample space for entertaining. There are two barstools with two small tables to watch the world go by. On this deck is a moderate sized propane barbeque with two 10 kg propane tanks. Further, the woodpile and ash bucket for the wood stove is also located here. On the ground floor and off the two front bedrooms there is a large deck for entertaining and relaxing in the sun. There is a resin-wicker love-seat with cushions, two reclining loungers and two folding resin-wicker deck chairs. Three fleece blankets are available for those cooler evenings. 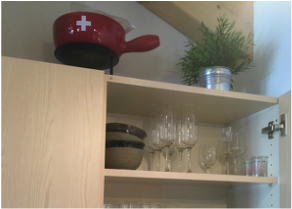 Swiss homes typically come without fixtures of any sort, however the owners had high quality fixtures installed throughout the Chalet. Each room has an array of lights with halogen spotlights providing the bulk of the lighting in living room, kitchen and bathrooms. There are LED reading lights in each of the bedrooms and overhead lights in the basement and bedrooms. There are exterior lights on each level for each of the decks and for the main entrance (on a motion sensor). Included in the sale is four full sets of bed linens, four duvets and 10 pillows, tea towels, bath towels, face clothes, hand towels, extra blankets and cushions. The basement or 'Le Cave' is tiled with ceramic tile throughout and has a large amount of shelving for storage. This is where all our bikes, skis and sporting goods are kept. In addition, we have a complete set of tools for household improvements or repairs, a medium sized wine rack, spare light-bulbs, sundries, cleaning supplies and a vacuum cleaner. A washer and dryer are positioned off the main basement area and an extra deep water basin with hot and cold water is installed here. An extra heater and dehumidifier help keep the basement dry and warm. When we say turn-key we mean it. We truly want the renter to be able to walk through the door and start enjoying the Alps immediately. The list is too exhaustive to outline here, but suffice to say you'll have everything you need to entertain your family and loved ones immediately.